ABS Insulating is a Duke Energy Certified Smart Saver Provider. Do you experience drafts in your home during the cold weather season? Do you notice a temperature difference between rooms? Does your HVAC system run continually even during moderate temperatures? 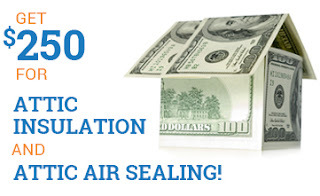 If your answer is “yes” to any of the previous questions, your attic may have air leaks or need additional insulation. By sealing air leaks and increasing the insulation in your attic, you will benefit from lower energy bills. Another benefit is better air quality in your home. Minimum of 1,000 square feet of air-conditioned area in your attic. Customer of Duke Energy residential electric service and residing in a single family home, duplex, townhome or condominium. Rebates are paid for qualifying finished improvements of your home after all application and supporting documentation have been submitted and approved, within 60 days of the date of service for work completed after the program start date of October 1, 2017. Attic insulation must be improved from R-19 or less to a minimum of R-30 and the leakage rate in your home must result in an improvement of at least 5%. Contact us to discuss your home’s energy challenges and how Duke Energy rebates can help.